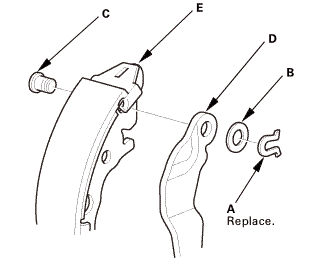 Remove the tension pins (A) and the retainer springs (B). Remove the lower return spring (A). 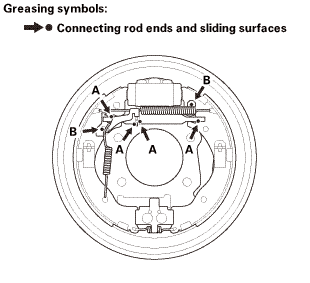 Remove the upper return spring (B). 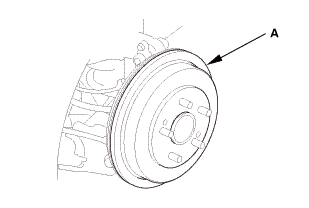 Pull the brake shoe assembly (C) forward. 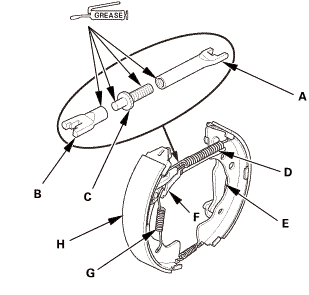 Disassemble the brake shoe assembly. 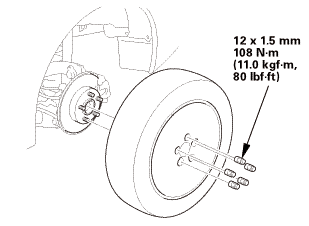 Remove the rearward brake shoe (A) by disconnecting the parking brake cable from the parking brake lever (B). Remove the wave washer (B). Remove the pivot pin (C). 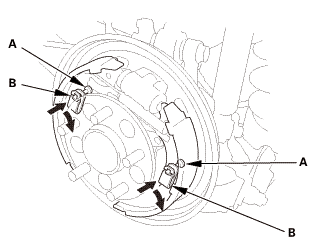 Separate the parking brake lever (D) from the brake shoe (E). Apply Molykote 44MA grease to the sliding surface of the pivot pin (A). Install the parking brake lever (B) and the wave washer (C) on the pivot pin, and secure the pin with a new U-clip (D). NOTE: Pinch the U-clip securely to prevent the parking brake lever from coming out of the brake shoe. 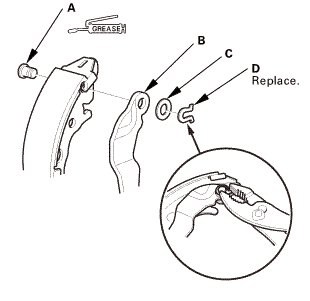 Apply a thin coat of Molykote 44MA grease to the connecting rod ends (A) and the sliding surfaces (B) as shown. Keep grease away from the brake linings. 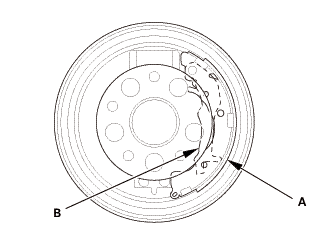 Apply a thin coat of Molykote 44MA grease to the shoe ends (A) and to the edge of the shoe surfaces (B) that make contact with the backing plate as shown. 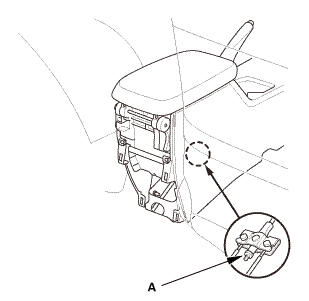 Install connecting rods A and B on the adjuster bolt (C). Clean the threaded portions of connecting rod A and the sliding surface of connecting rod B, then coat them with Molykote 44MA grease. Shorten connecting rod A by fully turning the adjuster bolt. 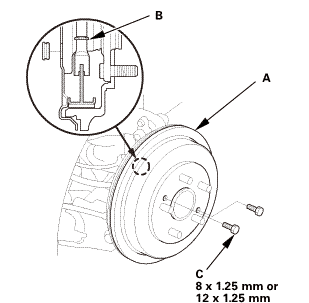 Assemble the brake shoes with the upper return spring (D), and the connecting rods and the adjuster bolt onto the backing plate. Connect the parking brake cable to the parking brake lever (E). 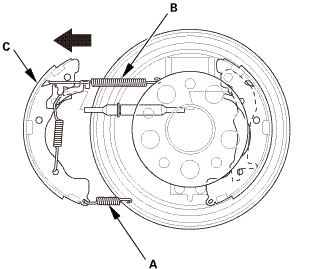 Install the self-adjuster lever (F) and the self-adjuster spring (G) on the forward brake shoe (H). 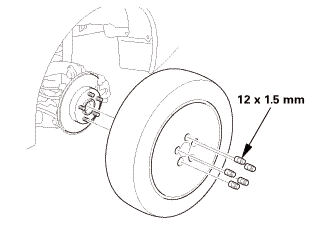 Install the tension pins (A) and the retainer springs (B). Install the lower return spring. NOTE: Make sure the brake shoes are positioned on the brake shoe bosses on the backing plate, and the fitting on the top of the brake shoes are fitted into the wheel cylinder pistons. 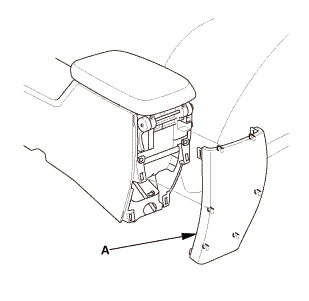 Press the brake pedal several times to make sure the brakes work and to set the self-adjusting brake. 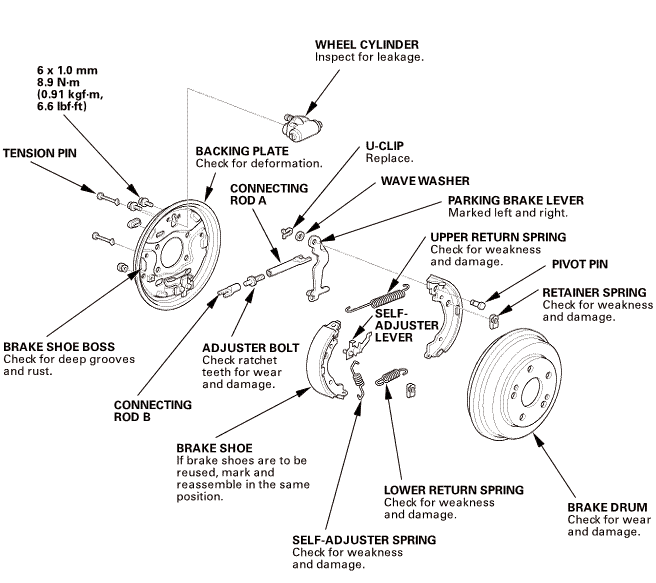 NOTE: Engagement of the brakes may require a greater pedal stroke immediately after the brake shoes have been replaced as a set. 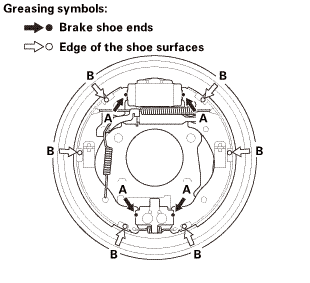 Several applications of the brake pedal will restore the normal pedal stroke.